The use of mobile technologies such as Smartphone, Tablet are becoming more pervasive in our daily lives. Obviously, it should also be used and integrated to support learning seamlessly. But not all learning environments can be used with all these devices. In some cases, special libraries are needed (e.g. flash not available on iPad, Mac OS X) or a permanent internet connection to a learning-platform is necessary. 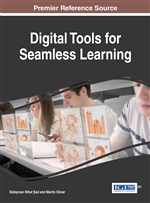 This publication proposes a new way in math education using the standard format PDF with completely auto-generated tasks for seamless learning and presents new learning scenarios for collaborations. On the one hand a new information system will be described and on the other hand use cases are carried out to establish individual learning. It can be concluded that individual math training is an important step to foster future education. Technology Enhanced Learning will not automatically lead to better learning outcomes. Learning is a task of the learner him-/herself (Hall, 1988; Wilson, Robeck, & Michael, 1974) and technology must be seen as a kind of supporter to enhance motivation, didactical possibilities and attention. Technology Enhanced Learning supports strongly problem based learning or project based learning in authentic contexts. Technology Enhanced Learning offers high quality learning content, which must be embedded in a didactical approach. Nevertheless, Kerres (Kerres, 2016) as well as Ebner (Ebner, 2013a) stated that in future there will be no distinction between digital and analog education. Because of the increasing digitalization there will be no other possibility. It can be summarized that in future math education will be strongly enhanced by digital applications. Digital and printed learning content (e.g. eBooks vs. textbooks). Web applications (e.g. search engines, social media). Applications with a special focus on education (e.g. learning management systems, online courses). Especially for particular learning content, the automatically generated examples will be very useful. Of course they have to follow some well-established standards to foster internationalization. Furthermore, we have to take a look at the precondition for a solid teaching. According to research works on empirical classroom education, the following crucial factors have to be pointed out (Altrichter, Helm, & Kanape-Willingshofer, 2012).